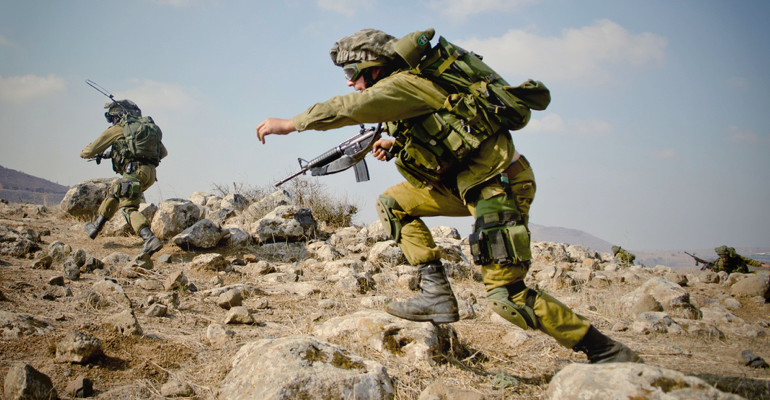 When forced to engage in warfare to confront terrorists – both domestically and abroad – Israel is often held to a double standard when employing military and security procedures which are in strict compliance with international law and the Geneva Conventions. On a daily basis, Israeli forces (and civilians) confront suicidal Palestinian stabbers, kamikaze car rammers, and homicide bombers. At the same time, Israel’s Iron Dome and David’s Sling missile defense systems safeguard Israelis from the deadly threat posed by Hamas’ and Hezbollah’s rocket arsenals. In an effort to decrease tensions, deter terrorists, and minimize security operations, Israel’s security barrier has reduced terror attacks by 90%, a fact that even the head of the Palestinian Islamic Jihad, Ramadan Shalah, himself acknowledged. Several months ago, a U.S. State Department spokesperson was questioned by a reporter when asking why the U.S. harshly condemned and chastised Israel for an airstrike that hit a United Nations-run school in Gaza when IDF forces were targeting terrorists in the vicinity, but failed to condemn its own actions when it struck a Doctors Without Borders hospital in Kunduz, Afghanistan in October 2015, killing 19 people and wounding dozens more. The harsh reality is that in modern warfare, innocent lives are often lost in the brunt of combat; however, Israel – even considering the fact that it’s surrounded by countries who would commit genocide of the Jewish state if given the chance – has proven itself to being the leading nation that’s committed to preventing innocent casualties and upholding the high standards of morality for its military procedures. Even with all these tactics employed, there were still some regrettable civilian casualties who were caught in the crossfire. It’s imperative to note that Hamas employs tactics to maximize the amount of civilians killed in battle. They use human shields (children and women) to protect their artillery; they store weaponry in UN built schools and hospitals and even fire rockets at soldiers from these buildings during ground warfare. They build bunkers under hospitals and use them as command posts and military bases. They exploit child labour to build underground tunnels that burrow into Israel. All of these efforts are bona fide war crimes and crimes against humanity. Furthermore, many of their military bases are built in densely populated areas. The ironic part of all of this is the fact that the ones who know Israel’s army to be the most moral, are the Hamas terrorists themselves, as they use these actions as defensive tactics against the IDF. One being that, yes, more Palestinians are killed than Israelis in this conflict, however when looking at past conflicts, take World War 2 for example, less than 100 civilians (and approximately 2,300 soldiers) were killed by the Japanese, compared to 225,000 by the US. That’s a 2250/1 ratio casualty count by the US. By the logic of Israel’s criticizers, that means that Japan was right and the US was wrong. To bring it to a more recent conflict, Russia’s encroachment in Syria and its airstrikes have killed over 1,400 civilians – yet the outrage is nowhere to be heard. Even more so, the US has killed more ISIS members than ISIS soldiers have killed US soldiers. Does that make them the bad guys because ISIS has a higher death count and because they are more properly equipped to defend themselves? Also, throughout the 50 day conflict in which roughly 2,100 Palestinians were killed – one half of whom were civilians – it’s very important to note that the army fired 34,000 artillery rounds, 19,000 of which were explosive. If one-half of the casualties were civilians and 19,000 rounds were fired that averages out to 19 shells per civilian killed. Remember that this does not include airstrikes, naval shelling, ground troops or tank shelling. This also includes the fact that the IDF was bombing very densely populated areas, and had to deal with the tactic of human shields. This is just a testament to the pinpoint accuracy of the IDF. Again, to say that Israel targeted civilians in this conflict is a ridiculous claim. Furthermore, according to BtSelem (an organization known for its animus against Israel), the number of Palestinian deaths since 1967 is roughly 11,000 Palestinians, compared to 2,000 Israeli Jews – numbers which would not even rank in the top 100 deadliest wars of the last century (this is over a 47 year span). During September 1970 in Jordan, 15-20,000 Palestinians were killed in one month. Essentially, more Palestinians were killed by the Hashemite regime in one month, then throughout the whole 47 year conflict. It’s fair to say there are other countries and serial human rights offending nations (Iran, North Korea, and Saudi Arabia) that are more warranted to receive just a quarter of criticism that Israel gets lambasted with on a daily basis, mostly by our news media. Once you take in all the facts and the disgusting, inhumane tactics posed by the Palestinian and Arab terrorists against the IDF and Israeli citizens, you can discern – even from an objective perspective – that a lot of the criticism the IDF and Israel receives is entirely unwarranted. Instead of being criticized, it’s evident that Israel should be lauded for setting a new moral precedent in modern warfare.